A student called to ask what my thoughts were related to sights for a home defense pistol. He asked what I thought about tritium night sights, fiber optic sights, and gold bead sights for his pistol. He planned to equip the pistol with a rail mounted light, which can be a very useful tool (see post on weapon mounted lights). Fiber optic and brass dot sights are designed for competition shooting, which is traditionally held in a bright environment, though occasionally, there are low light defensive pistol matches. For a defensive pistol, it is hard to beat tritium sights. 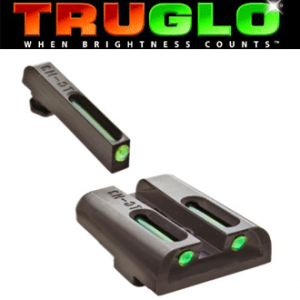 Small, tritium inserts which glow in the dark, help an armed officer or law abiding citizen acquire their sights under reduced light and no light conditions. 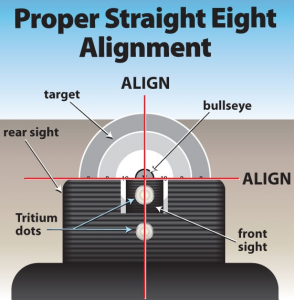 Clearly there are situations where a person will not use their sights (instinctive shooting), but tritium sights give you an option that traditional sights do not. Made by several manufacturers, the two brands of tritium sights that I prefer are the Heinie Straight Eight LEDGE sight and the XS 24/7 Express Sights. Richard Heinie makes some of the best sights on the market. They are high quality, precise sights and are worth the money. Having carried various pistols over the years, I‘m familiar with the traditional Trijicon tritium 3-dot sight. This sight requires the shooter to line up the 3 tritium lamps horizontally with the front sight dot between the two rear dots. These sights work fine and are very common. The Heinie Straight Eight is a vertical sight. There are only two tritium lamps in this design. The shooter “stacks” the two dots to line them up, giving the appearance of an “8”, hence the name “Straight Eight”. Heinie builds excellent target sights; the Straight Eight night sights are high quality target sights that have tritium inserts added. Additionally, sharp edges that are common to match sights are not present on Heinie defensive sights. This allows the shooter to quickly load, reload, and clear stoppages without the added risk of injury to the support hand. 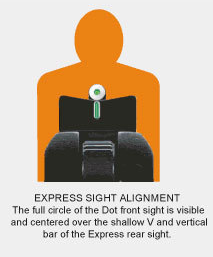 Similar to the Heinie Straight Eights, the XS Sights 24/7 Express Sights utilize a vertical sight alignment. The Express Sights incorporate a “Big Dot” Tritium or “Standard Dot” Tritium front sight with a vertical tritium “post”. This is one of the best “flash” sights on the market for day light engagements, and an excellent setup for low light environments. The Express sight also offers a low profile, snag-free design that reduces the likelihood of injuring the support hand, while allowing the shooter to use the rear sight as a slide-racker during incapacitation drills/incidents. Personally, I prefer the “regular” dot to the “Big” dot, but that is simply my preference. One additional sight that I wanted to mention is the Truglo TFO or Tritium Fiber Optic Sight. Years ago when fiber optic sights first hit the market, I put a set on a Glock 22 that I used for IDPA. I loved how quickly I could acquire those sights. They weren’t quite as accurate as I wanted, but they were fast for the 5-10 yard scenarios. My daily carry pistol back then was a Glock 23. I had factory Glock Trijicon tritium night sights on it which were fine in low light, but I wanted the same “glow” that I had at night, during the day. I discovered the TFO sights and quickly bought a set and mounted them to my G23. They took a bit of getting used to, but they turned out to be good all-day sights. The only drawback was the length of the front sight. The design of the sight put a fiber optic rod in front of a tritium lamp. During normal light the fiber optic rod would glow from ambient light. During low light conditions it would transmit the tritium glow. The issue was that the front sight was nearly an inch long, which meant that the effective sight radius was reduced by nearly an inch. On a Glock 23 that’s almost a 20 percent reduction in sight radius, which equates to a less accurate pistol. This is simply a tradeoff. You are trading the ability to shoot a little more accurately in one lighting condition for the ability to acquire your sights faster (or simply acquire them at all) in all lighting conditions. To that end, I like the TFO sights; they serve their purpose well. In the end, the sight you choose should be one that works well for you. Most factory sights are simple and get the job done, but leave something to be desired. When changing a sight, it is important to have it installed by a competent gunsmith or armorer, and to benchrest the pistol to ensure the sights are zeroed for you. Finally, it is very easy to get caught up in the “equipment race” trying to find that perfect sight that will prevent you from ever missing. Remember most shooters need practice, not new equipment. 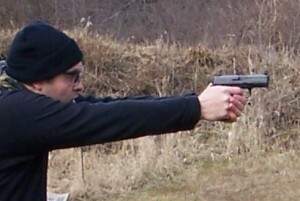 It takes a lot of work to develop the ability to out-shoot a stock defensive pistol. Invest in good quality equipment and then safely practice with your equipment to develop this life-saving skill. Thoughts on ammo and defensive pistols…. Now, what is the best “defensive” handgun on the market? I can answer that a couple of different ways (1) “Whatever is incredibly reliable and the person shoots best“; I really don’t believe in a one-size-fits-all solution to this question. I do believe the gun should be chambered in 9mm or .38 spl or larger (no magnums unless concerned with bears, wolves, cats or moose); (2) “The Glock 19“. It is the correct size to carry concealed for many people in a strong side hip holster. It holds a 15+1 rounds of 9mm and it will take the G17 mags, so you can carry 16 rounds in the pistol and have a 17 round magazine as a spare. For a smaller framed person, I’d go with the G26 simply for concealment issued. If carrying concealed was not an issue, then I’d strongly consider the Glock 17. I believe the S&W M&P is just as good of a pistol and it works better for left-handed shooters, plus it has better magazines. The Steyr M9A1 (often over-looked) is one of the best point-shooting pistols ever made and it is the same size as the G19 – that should also be a strong consideration. To help support my claim, some of the best instructors throughout the country (you’ll have to look them up) have given up their 1911’s for 9mm Glocks (or M&P’s / Springfield XD’s). If you agree or disagree, feel free to share your thoughts on the comment page. About 2 months ago I received an invitation to test and evaluate FN Herstal‘s new FNS series pistol. After viewing some of the basic information about the pistol, I was excited to say the least. Having shot several polymer guns competitively and carried striker-fired pistols both on and off duty, I wanted to get first hand experience with the latest in this class of defensive pistols. I’ve always liked FN firearms, so the FNS held promise for me. The sample I received was a 2-tone, 40 S&W with three 14 round magazines and night sights. Also included were interchangeable back straps (flat or arched), the owner’s manual, and a cable lock. I read through the owner’s manual and noted the safety precautions along with the dis-assembly procedures. Dry firing the pistol a few times, I liked the trigger reset length and the thought the “weight” of the trigger was reasonable – without putting it on a scale, I’d estimate it was about 5.5 pounds. The take-up was about 1/4 inch, with the travel to break about 1/8 inch, which is also the reset length. The gun weighs about the same as a Glock 22 or M&P40 with clean lines and an appropriately sized beaver-tail to protect meaty hands from hungry slides. The angle of the grip also lends itself to establishing a quick, high grip with the shooting-side hand. The controls were all appropriately sized, though the model that I tested had a manual safety similar to that of a 1911 series pistol, however thelever was fairly small. I’m not a big fan of small buttons, levers, or controls on firearms; under stress these are difficult to use. The plus side of the safety was that the safety, along with the polymer mold around the slide stop, blocked my thumb from riding the slide stop down during strings of fire; several slide-lock reloads and the slide locked back each time. The magazine release is large and easy to hit – with either hand. This pistol is truly ambidextrous – right out of the box. I encourage my students to practice shooting with both/either hand, this pistol will make those transitions very easy. The sights are good factory sights. Anyone that spends much time with me, knows how much I like Heinie Straight 8 night sights, so if the Straight 8’s are an “A” sight, I’d give these a “A-“. The rear sight notch (aperture) has a rounded bottom. The human eye is very good at centering a square in a circle or a circle in a square, but it struggles to center a square in a square, so this sight favors our eye’s natural tendency. The front sight has a tritium insert wrapped in a very noticeable white sleeve. The white sleeve almost works like XS Sight’s Express (Big Dot) sight, which is another excellent combat sight. In the end you have a robust sight that is easy to pick up quickly. This is not a “target sight” by any means, but it doesn’t need to be one and it serves well as a combat sight. The rear sight does have the “ramp” that so many manufacturers use; I fail to understand the benefit of this design; I know that it is a limitation that does NOT benefit the shooter during incapacitation drills. If I buy a FNS to carry, you can bet I will square the rear sight before I leave the house with it. Okay, so enough about the design of the gun – how did it shoot? Marksmanship – I rested it at 20 yards and ran 3 groups of 5 rounds on 4 different factory loads by Winchester, Federal, and Speer. The pistol consistently shot groups around 3.5 inches,. with some groups around 5-6 inches. The pistol loved the hard-hitting 155 grain Winchester Silvertips. From the rest, this pistol was able to put 15 rounds in a 3 inch group at 20 yards (again 3 – 5 round strings), that was the best group of my accuracy testing. The pistol & magazines functioned properly with each round fired. 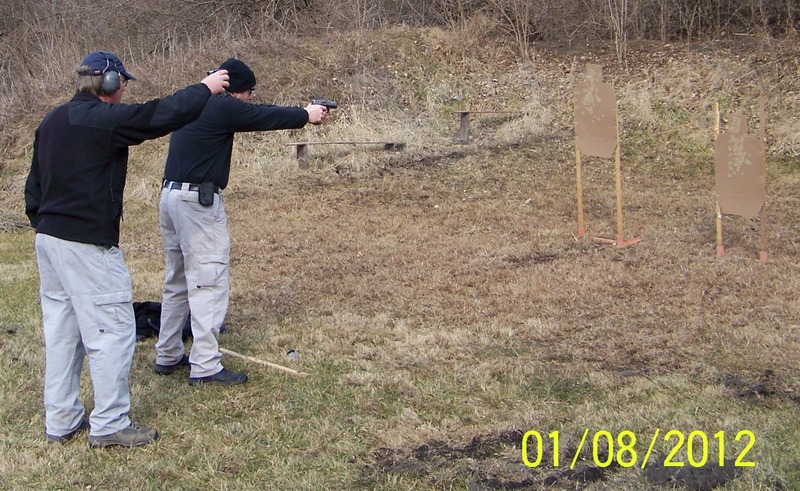 Combat Drills – Using the Hackathorn Standards as a basis for my 1st combat test session, I was please with my performance on a pistol that I had bench-rested. Using a Safariland 6360 designed for a S&W M&P40, the FNS fit very well, however the ALS did not lock, but that was to be expected. Establishing a solid grip was effortless, the sights were easy to find, and followed my eye as I tracked from target to target, as well as during quick strings of fire. The ambidextrous magazine release was easy to hit as I worked through various reload drills, and the slide stop worked well as a slide release, as did power stroking the slide on combat reloads. The magazine found the mag well easily due in part to the beveled mag well. Another advantage of the ambi-mag release is for those shooters with smaller hands, who find they have to rotate their grip to hit the release with the shooting side thumb. 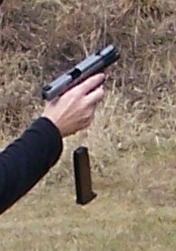 With the ambi-mag release, smaller-handed shooters can use the trigger finger or middle finger of the shooting hand to release the magazine, without having to re-establish their grip after the release/reload. Combat accuracy was acceptable, shots grouped in about a hand-sized circle (8″), with the exception of the few rounds that I pushed elsewhere…. I also ran drills while wearing various gloves and found the trigger guard was sized appropriately for wearing winter gloves – a huge plus during cold weather. Competitive Evaluation – To round out the evaluation, I ran the gun at my local IDPA club’s January match. 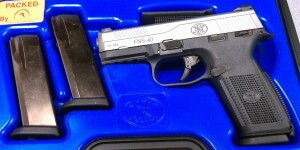 The FNS40 ran flawlessly and caught the eye of several competitors; a few suggested that the gun appeared to be “made for me”. On a quick run & gun stage, I was pleased with the trigger and the large white dot on the front sight which helped me keep my shots in the A-zone. On the skills drills, the magazine release was easy to find; the robust, metal magazines dropped free of the magazine well quickly; and the grip’s ultra-aggressive texture helped me control the quick 6 round dumps on “Bill Drills”. To add a little variety to the match, we had a zombie stage that required moving laterally, while engaging zombie heads with two rounds per undead threat. The sights are well suited for this accuracy requirement, which along with the well-designed, consistent trigger helped me avoid the painful challenge of not defeating the horde of attacking zombies! Final thoughts – the FNS is a solid pistol – I love the grip of the pistol, it has a decent trigger, and the ergonomics are excellent. About the only complaints I have are the 14 round magazines and the ramped sights. In a full-sized duty pistol, the standard for capacity has been 15 rounds for many years, FN should beef up the magazines to hold 16 rounds, if they want to aggressively fight for the law enforcement market from Glock and S&W. Additionally the small, manual safety works well enough when consciously thinking about disengaging it, but under stress, deactivating the safety lever might prove inconsistent, which is not a good attribute for a defensive pistol. That being the case, the manual safety is an optional feature and one that this pistol simply does not need, so for me I’ll just order one without the manual safety and look forward to an aftermarket base pad that adds 2-3 rounds to the magazine capacity.